Precise control of dispensing, and stable micro dispensing; replaceable and modular design; Zero adhesive residue. Adjusting by single mechanical component, high availability, unique noise reduction design can fully reduce noise. Wetted parts are easy disassemble, easy cleaning and maintenance. small volume and high energy, the smallest volume thrust ratio in industry comes from the designs of the optimum water-cooling structure, winding process, magnetic circuit optimization, the lowest speed fluctuation and thrust fluctuation. The installation is flexible. The installation process takes only 5 minutes without explanation. It's as simple as that. Cartesian robot can be used in the following fields of industrial production: transfer robot, medicine dispensing robot, stacker, punching manipulator, loading and unloading manipulator of machine, inspection manipulator, transplanting manipulator, automatic production line in factory, dispensing, drop models, spraying, sorting, packaging, welding/soldering, assembly, printing, and so on. the perfect combination of linear transmission technology and mineral casting technology gives the customer a decisive advantage. Anda Automation provides not only innovative, high-precision solutions of mineral castings, but also assembled component and complete system. One-stop solution of linear motors, linear guides, driving devices, electrical and sensing devices, allows us to ensure the optimal integration of different components. can apply to PCBA conformal coating, dam technology, solder mask, DIP component reinforcement, and so on. can apply to SMT underfill, component packaging, dispensing solder paste, dispensing red adhesive, dispensing black adhesive, semiconductor packaging, wafer bonding, and so on. can apply to cleaning and surface activation treatment before manufacture procedure in the following industry fields: printing and packaging, mobile phones, computer and digital products, plastics, glass, electronics, automobile, medical, metal, and so on. Continuously provides high quality system solutions with high-speed dispensing, precision spraying technology, UV curing technology, plasma cleaning process for intelligent mobile phone, aerospace, energy, automobile, medical and other technology terminal markets based on many years experience of fluid application control technology. Anda Automation is a system solutions developer dedicated to research and development of core component, fluid application and customized solutions. The main products are precision pump valve, linear motor, servo guide, polymer mineral casting, optical components and others used in basic fields. The fluid control technologies such as high-speed dispensing, precision spraying technology, UV curing technology and plasma cleaning process, has been used in many market segments including intelligent mobile phone package, 3D touch screen technology, camera module, fingerprint module, semiconductor and so on. The company continuously provides high quality and high efficiency system solutions for technology application markets of intelligent terminal, aerospace, energy, automotive, medical, and others based on many year experience of dedicated development in materials application, mechanical structure, electrical control, visual and software. 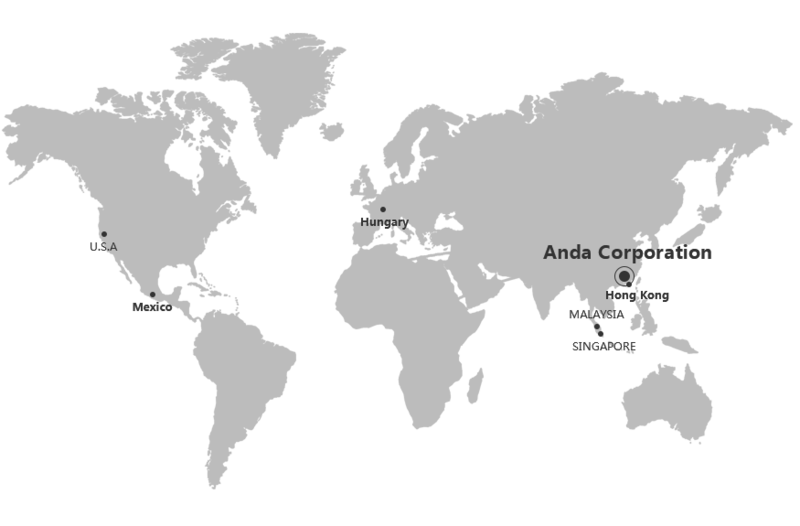 Anda has more than 20 technical support networks across the world. The perfect marketing service networks provide high quality service for you quickly. Dongguan Anda Automatic Equipment Co., Ltd.